NKJ Philippians 2:5-8 Let this mind be in you which was also in Christ Jesus, 6 who, being in the form of God, did not consider it robbery to be equal with God, 7 but made Himself of no reputation, taking the form of a bondservant, and coming in the likeness of men. 8 And being found in appearance as a man, He humbled Himself and became obedient to the point of death, even the death of the cross. 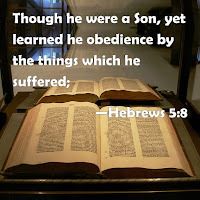 NKJ Hebrews 5:8 ... though He was a Son, yet He learned obedience by the things which He suffered. In the context of this statement, the author of Hebrews has Jesus' suffering in the garden of Gethsemane and on the cross primarily in view, but we know He began to learn obedience and to suffer long before that, in part because the passage before us today tells us so. In this passage we can see how Jesus is an example of obedience for us both toward His earthly parents and toward His heavenly Father. We will examine each of these aspects of obedience, but we shall do so with a particular emphasis upon the importance of believing children seeing in Jesus Christ a special example for them. NKJ Luke 2:51a Then He went down with them and came to Nazareth, and was subject [ὑποτάσσω, hupotássō] to them …. NKJ Ephesians 6:1 Children, obey [ὑπακούω, hupakoúō] your parents in the Lord, for this is right. 2 'Honor [τιμάω, timáō] your father and mother,' which is the first commandment with promise…. You see, when you obey your parents as Jesus obeyed His parents, you honor them. This means that you show them respect and treat them as though you think highly of them. Notice also that the commandment tells children to obey both of their parents, not just their fathers or their mothers, but both their fathers and their mothers. And this is just what Luke says that Jesus did. He says that Jesus was “subject to them” (italics mine), meaning both Joseph and Mary. Sadly, there are many children that don't do this. For example, maybe their mother has to tell them that they will be in big trouble when their father gets home in order to get them to obey. But this should never happen! You should never have to be threatened by punishment from your father in order to obey your mother. When this happens it just shows that you do not honor your mother as you should, as Jesus honored His mother Mary by obeying her just as he obeyed Joseph. But what about when your parents do something wrong or treat you unfairly? Or what about when it is hard to obey them because they don't seem to understand your point of view? Well, I think you can find encouragement from Jesus' example here as well, because you can see that He understands what you are going through when it is sometimes hard to obey your earthly parents. We see in verses 48-50 that Jesus knows what it is like to be misunderstood by His parents. NKJ Luke 2:48-50 So when they saw Him, they were amazed; and His mother said to Him, “Son, why have You done this to us? Look, Your father and I have sought You anxiously.” 49 And He said to them, “Why did you seek Me? Did you not know that I must be about My Father's business?” 50 But they did not understand the statement which He spoke to them. Mary was not being fair when she scolded Jesus for staying behind and talking with the teachers in the Temple. She and Joseph should have known that He was supposed to be about His heavenly Father's business, but they clearly did not understand this. Nevertheless, Jesus went back home with them and obeyed them anyway. But this leads to another way in which Jesus understands what you might sometimes go through as young people who are called to obey your parents, for Jesus knows what it is like to be midway between following God's will for His life and that of His parents. Again, Jesus' parents ought to have understood that He must be about His Father's business. After all, they both knew who His true Father was! But we have seen in this passage that Jesus had to learn to balance His desire to follow His heavenly Father's will with His obligation to obey His parents who struggled to understand. This is a part of what it means when Luke later says that “Jesus increased in wisdom and stature, and in favor with God and men” (vs. 52). This leads us to our next main point. He clearly expected them to know that His Father's business was the top priority of His life. But, as we have seen, in the face of their misunderstanding, He graciously submitted to them and obeyed them, and in doing so obeyed His heavenly Father in continuing to learn as a dutiful and loving earthly son ought to do. In fact, I would submit to you that Jesus learned obedience to His heavenly Father even better through learning obedience to His earthly parents. As a child, Jesus had to grow just like the rest of us. And, even though He never sinned or disobeyed His parents, He still needed to learn as He grew more and more about what it meant to obey His parents, and sometimes this even meant that He had to suffer being treated unfairly by them. 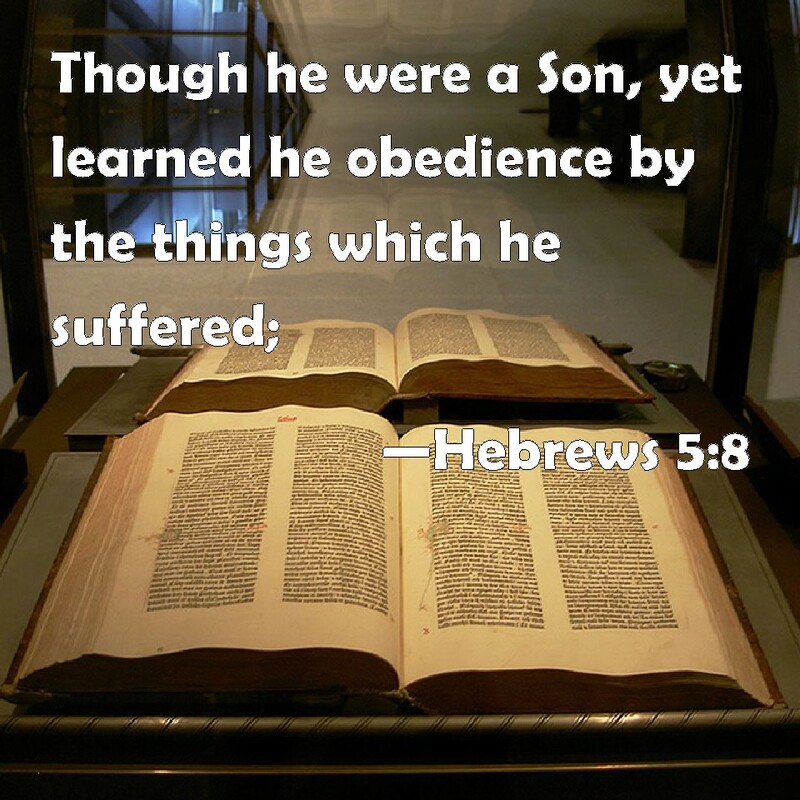 NKJ Hebrews 5:8 ...though He was a Son, yet He learned obedience by the things which He suffered. NKJ Luke 2:40 And the Child grew and became strong in spirit, filled with wisdom; and the grace of God was upon Him. Even though you will never be perfectly and sinlessly obedient as Jesus was, through His saving work you can have the same grace of God upon you that was upon Him! And you, too, can increase “in wisdom and stature, and in favor with God and men” (vs. 52). There has not yet been another article posted in this debate, at least not that I have seen. However, I do encourage reading the articles that have been posted. In my opinion, both men raise some very important issues, but I have a definite affinity for Roberts' point of view. What do you think? As I explained when I first posted the poll, I have regarded "substantial adherence" to the Baptist Confession of 1689 as adherence to the theology contained in it, but not such strict adherence that modifications or refinements are not welcomed if deemed Scripturally appropriate. I recognize that there is a fair amount of debate as to what "substantial adherence" should mean, but I hoped I had phrased the question in such a way as to clarify what was intended for the purpose of this poll. 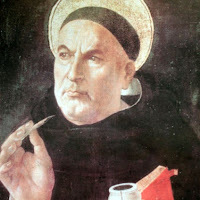 The word substantial was taken primarily to mean being largely but not wholly that which is specified, but it was also intended to emphasize agreement concerning essential doctrinal matters while allowing differences on some matters deemed less essential to Scriptural orthodoxy. For example, I explained that one might be willing to modify the confession with regard to such things as the proper understanding of the Regulative Principle of Worship, Divine Impassibility, or the proper nature of Sabbath observance. The term modify was used simply with the meaning make one or more partial changes to. I included the example of Divine Impassibility, in particular, since that is a current topic of debate in which some are arguing that a modification in the statement of the doctrine -- not a rejection of it -- should be allowed, and some are arguing against it. At any rate, with these points in mind, I would like to make several observations regarding the results of the poll. First, the poll revealed that a strong majority (87%) of self-identified Reformed Baptists think that simply holding to Calvinistic soteriology, together with the Baptist distinctives that are presupposed in the respondents, is an insufficient basis for properly regarding oneself to be a Reformed Baptist. In fact, only 13% thought that this was sufficient. So, there is a strong consensus that a Calvinistic Baptist who holds, say, to Dispensational Theology, should not properly be regarded as a Reformed Baptist, a fact that should not come as a surprise. 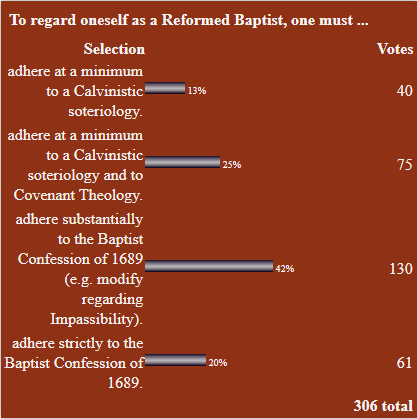 Second, the poll revealed that a majority of self-identified Reformed Baptists think that one must hold to the Baptist Confession of 1689 (whether strictly or substantially) in order to properly be regarded as such. However, this majority was only a 62% majority, which means that well over a third of self-identified Reformed Baptists (38%) do not think that one must hold to the Baptist Confession of 1689 at all in order to properly be regarded as such. This, too, is not surprising. As I pointed out in response to a previous poll conducted back in 2008, this state of affairs reflects the historical fact that not all of those who have called themselves Reformed over the centuries would necessarily adhere to the English confessions written in the 17th century. For example, there are many Reformed of a Presbyterian stripe that would not adhere to the Westminster Confession of Faith (such as the many Dutch Reformed and those springing more directly from this background). So, it should not be surprising that many Reformed Baptists should similarly regard the 1689 Confession, which so closely reflects the Westminster standard, as being too narrow a definition of the term Reformed as applied to them. In other words, the poll results in this regard are well within the limits of what one should expect, at least if one has a fair knowledge of the history of Reformed theology, together with a basic knowledge of what has become the Reformed Baptist movement. The former indicates more flexibility in the use of the term Reformed than with reference strictly to the Westminster tradition, and the latter indicates more flexibility in the use of the term Reformed Baptist than with reference strictly to the 1689 Confession. 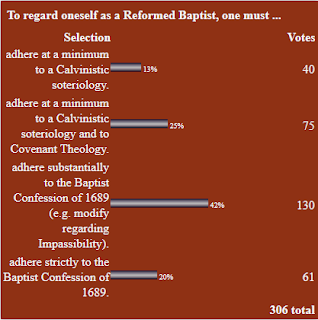 Third, the poll revealed that, among those who regard holding to the Baptist Confession of 1689 as essential to properly identifying oneself as a Reformed Baptist, a majority think that only substantial subscription should be required. In fact, more that twice as many held this view rather than the view that would require strict subscription. There were 42% of the respondents who would say that one must adhere substantially to the Baptist Confession of 1689 over against only 20% who would say that one must adhere strictly to the Baptist Confession of 1689 in order to be regarded a Reformed Baptist. These strict subscriptionists, then, apparently make up a rather small minority among self-identified Reformed Baptists. It is also noteworthy that, given that the example used to differentiate between substantial and strict subscriptionists was a willingness to modify the Confession with respect to the doctrine of Divine Impassibility, those who hold the strict view concerning this doctrine are also in the minority. To be sure, this poll is not at all scientific, and we do not settle doctrinal issues by taking a poll anyway, but it is nevertheless remarkable that a majority think that a modification in the statement of the doctrine -- not a rejection of it -- should be allowed. As with the other results of the poll, so also this result is not surprising, since there have been differences among Reformed theologians concerning this doctrine for some time. However, I don't doubt that this result will come as a surprise to some, since those who hold the strict subscriptionist view have been so vocal of late and have perhaps left the impression that they are actually in the majority. As the interviews reveal, Curt wrote his doctoral dissertation at the University of Edinburgh on “Hyper-Calvinism and John Gill” back in 1983. Curt has expert knowledge of the issue, as well as of the history and theology of Calvinism in general. In fact, I also highly recommend checking out Curt's teaching series on The History and Theology of Calvinism.